For quite awhile now I have wanted to see how my RO would shoot if I converted it to a 38 super. I found a nice deal on a 6" Storm lake barrel and decided to give it a try. The barrel was supposed to be a drop in so I wasn't worried about any fitting that might be required. Of course it didn't drop in. I was going to take it o a local smith but decided to try it myself (with a little help from Kuhnhausen). I was actually pretty happy with the results when I got it to go into battery the first time. I may have spent more time reading then I should have because I wasn't happy with the total picture when I was finished. I played with it some more and this was the result. Yea, it is not the RO. The barrel fit perfectly in my Kimber Gold Match II and that is where it is going to stay for awhile. I was able to make it to the range today and besides testing some .45 rounds I was able to test 8 different loads thru this pistol today. I was not able to make it to the 50yd line today but I will make it sometime soon. Terry (Magnus Bullets) sent me three more bullets to test. In the next couple of weeks I plan to test them at 25 and then only test the 4 best loads at 50yds. I was not un-happy with some of the groups today. I see it's 66 now and not 65 like the old days. Time keeps marching on. Being to lazy to get up and check my manuals I would have to ask. Is it possible to just ream out the 9mm barrel to 38 Super? 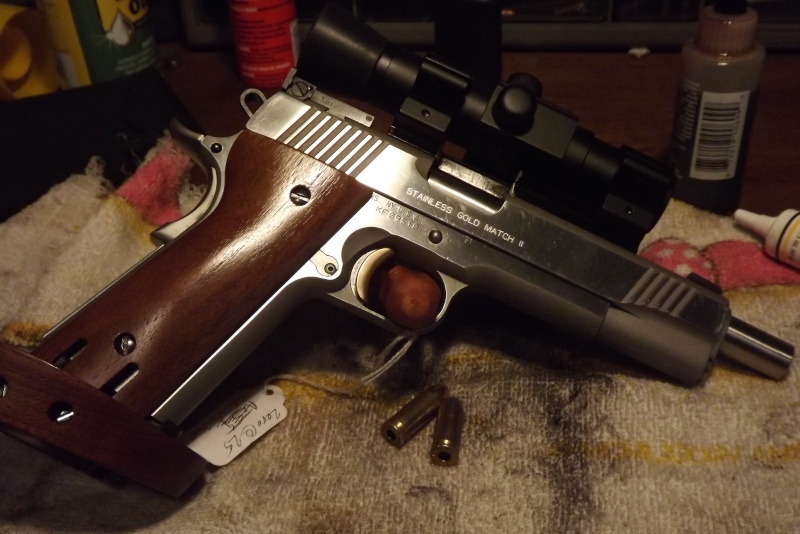 I imagine that you did this so that you could if needed return the RO or the Kimber to it's original state but if someone wanted to be cheap wouldn't the reaming to 38 Super work? I think the 9mm chamber is larger at the base than the super. In the 9mm/38super the ejector is wider and the corresponding cut in the slide is wider and the extractor is different. The Colt magazine has an insert at the back but uses a 38 super body. Wobbley wrote: I think the 9mm chamber is larger at the base than the super. In the 9mm/38super the ejector is wider and the corresponding cut in the slide is wider and the extractor is different. The Colt magazine has an insert at the back but uses a 38 super body. 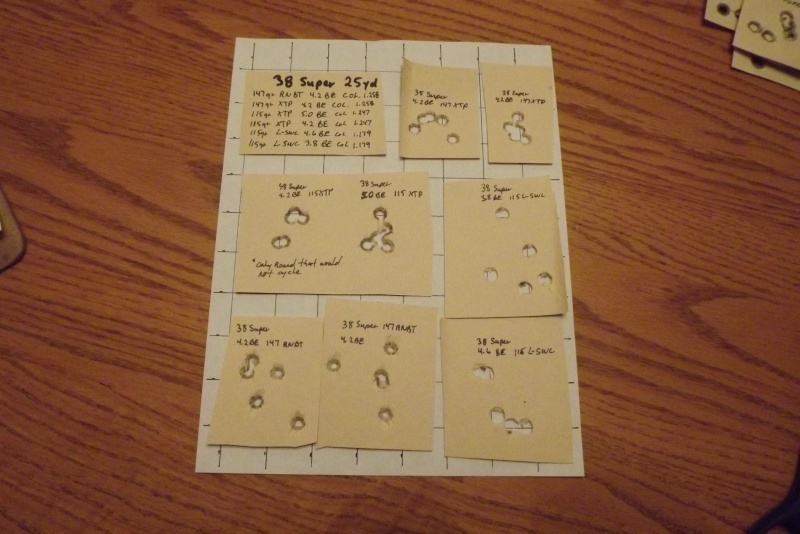 I know that the 9mm/38 Super would be a different extractor and ejector than the 45 acp but wouldn't those be the same for either the 9mm or 38 Super? The rim diameter for the 38 Super is only .0013 larger difference from the 9mm and I would think that a bit of adjustment would make it work without replacing them. But then I've been wrong before. The RO was a good choice for converting and to be honest it would have shot pretty good if I left the barrel in it. The lock up and fit of the barrel was good but the slide to frame fit was just not as good on the RO as the Kimber. I should mention the Kimber was a 40 S&W with the same W/N ramp as the RO. 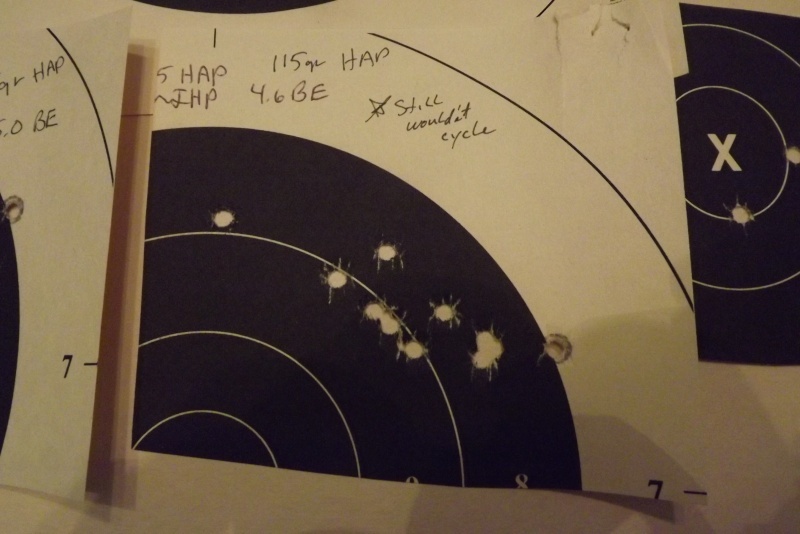 In all the bullets I tested the only fail to cycle were the 4.2 115gr XTP bullets. The 3.8 115gr LSWC all ran great and felt like they were the beefier load. It would be hard on casings but you can ream the 9mm barrel. My local gunsmith has access to the equipment to do just that. My first attempt to convert a 9 to 38 super was with my model 39. I went so far as to snag another barrel on Ebay for the project then just let the idea go when I realized that it would never be a bullseye pistol. I will post the results of new tests when I get a chance to shoot again. 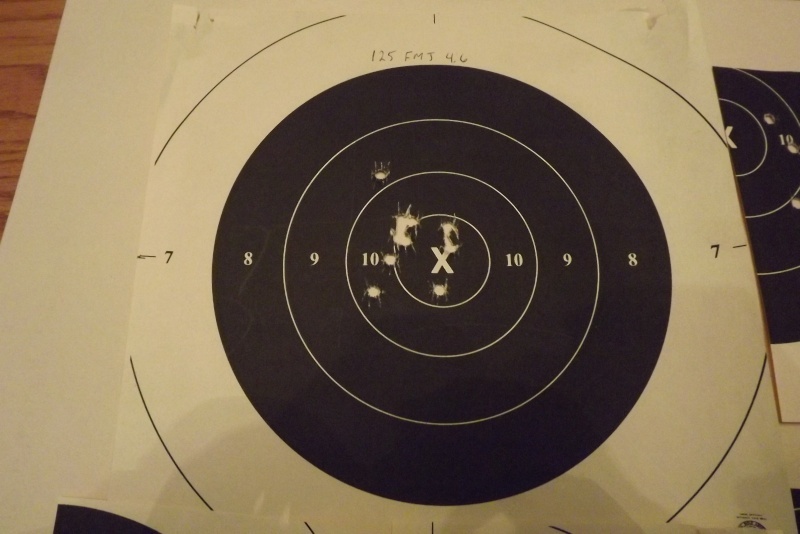 I made it to the range today and was finally able to test some of the bullets I loaded up from Magnus Bullets. 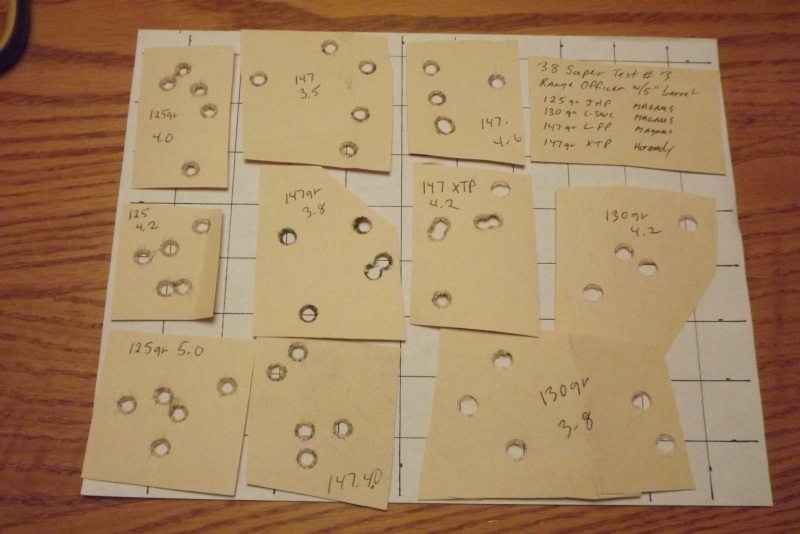 I was not able to make it to the 50 yd range but I have narrowed down the bullets that I will be testing down to 5 different rounds. All 5 have had good enough groups that I need to check them out on the long line. In another note I finally went ahead and converted the RO to a Super also. I was able to get my hands on a 5" barrel. I had to put a #4 link to make it fit right. The Kimber outshot the RO but that was not a big surprise since it was a lot tighter to start with. 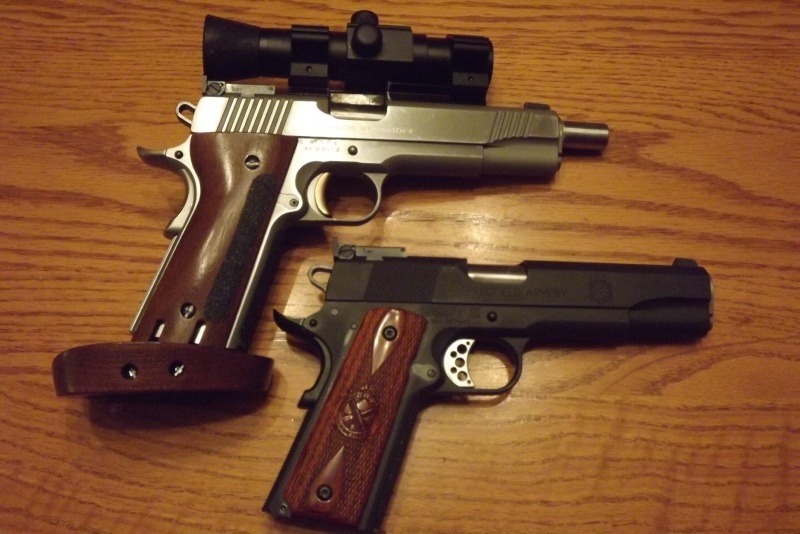 Both pistols are 38 Super now. 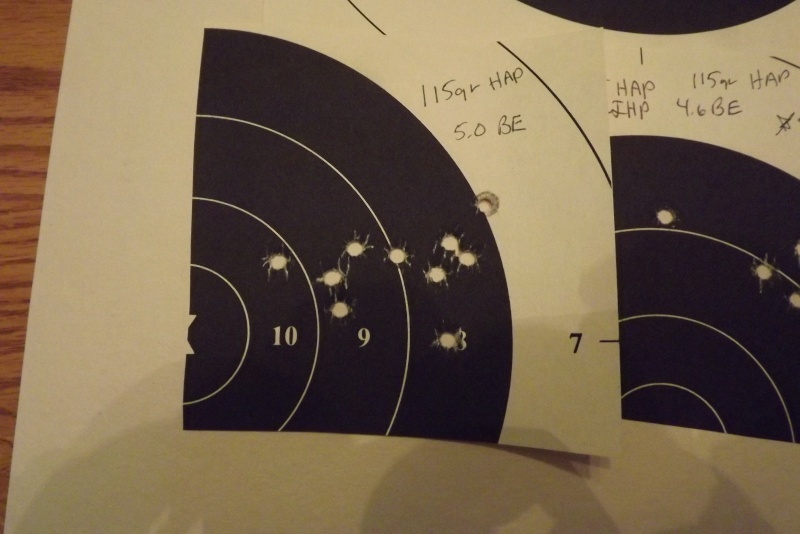 The Range Officer liked the same loads best that the Kimber liked but did not do so well with the 130gr. I also ran some XTP to see how it worked with that load. The Kimber test showed a couple of loads that might work for the long line. 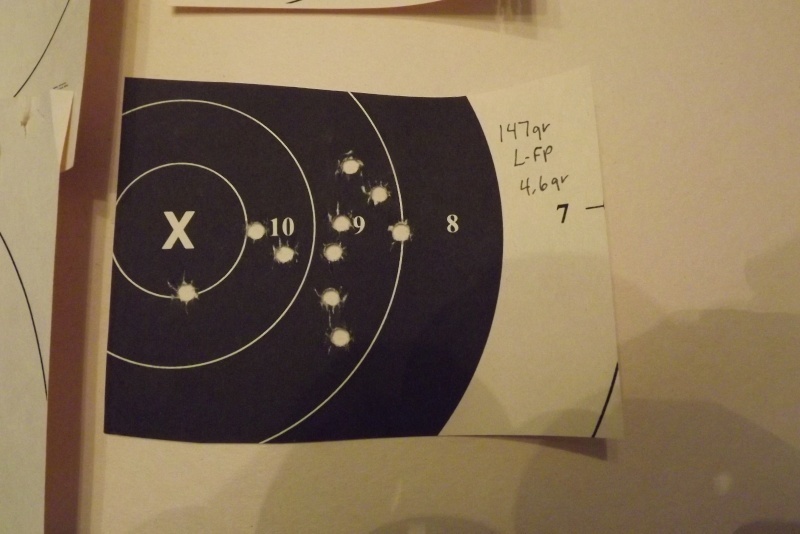 I liked the 125gr @ 4.2 also. It is nice to see some of the bullets grouped pretty good. I would worry about the pistol if I hadn't of got some groups better then others. I will be testing these bullets at 50 yds. I will want to shoot up the less expensive lead bullets so my short line/practice loads will be. It was the perfect combination of good and bad weather today. The sun was shining, no wind and the swell was too big to work at sea. 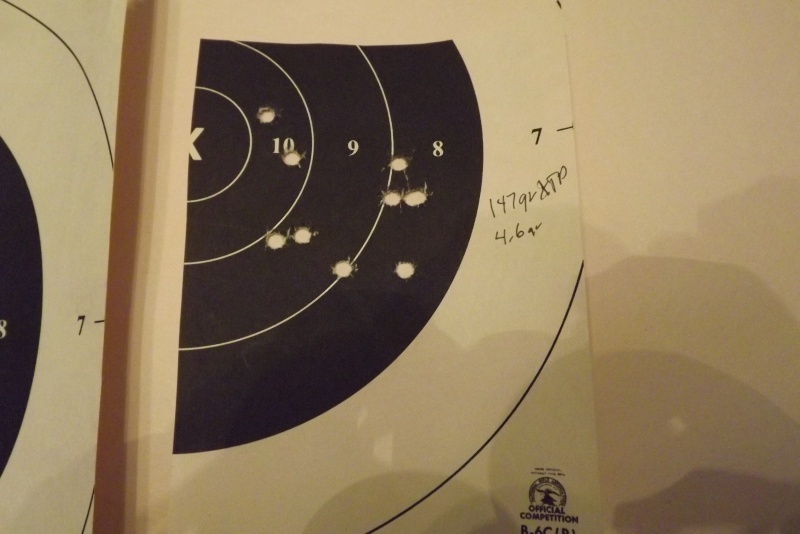 I made it to the 50 yd range today and managed to get some tests done. 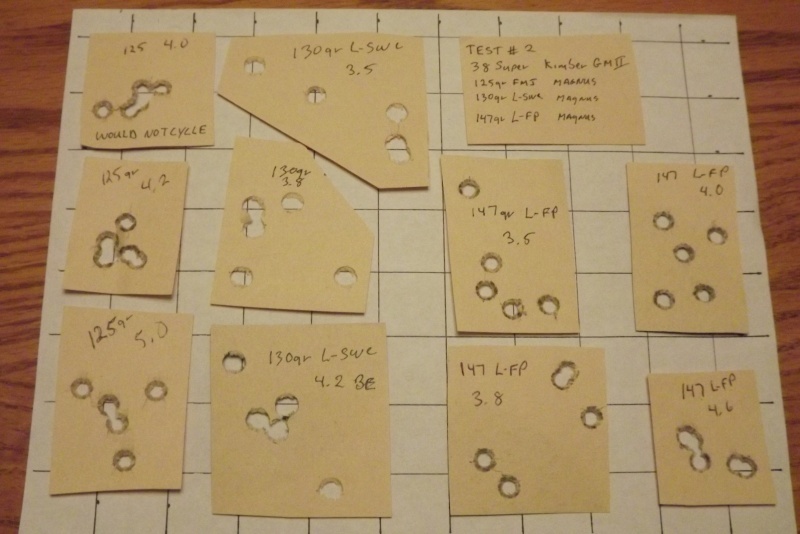 I think I need to remind the readers that I am testing these bullets with a Lee Pistol rest. They are nice rests but a little skill is required to use them and it is very possible to make human errors. I mention that because I think the odd flyer is probably me and not the rest or guns fault. With that caveat out of the way I still think some of these groups were pretty good. I was thinking I could take any bullet I tested today to a match and still have only me to blame if the shot was not a 10.